By nature, we tend to make it our business when there are tribulation and disaster in the world. Why? Because our heart breaks for the suffering. We want to help but sometimes it is beyond our means. So we say we will pray for those who are going to be hit by this new storm. Though it is a gift in and of it self to pray. But have we forgotten about the people who survived the last hurricane? Not completely I'm sure, but our prayers for them have now grown thin because they made it through the worst we think. However, in my opinion, they are now facing the biggest disaster, "themselves". Yes as small as that sounds it's true. You see I've lost everything before, I know the heartache, confusion, desperation and the what ifs. I had days to let it sink that I was going to lose everything also. Before the storm is the preparation. Looking around and quickly having to decide out of your whole entire home what is most important to you at the moment. Something materialistic that matters to you besides your family and life. 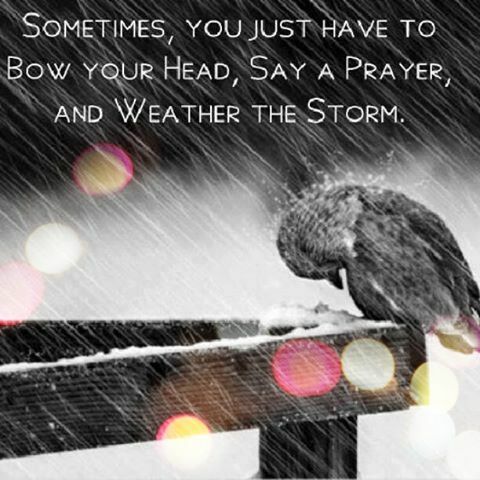 The storm hits you hunker down and Thank God you are safe.